Large waves in the solar wind cascade down to smaller turbulence effects, much the way large ocean waves cascade to froth at their crests. From Earth, the Sun looks like a calm, placid body that does little more than shine brightly while marching across the sky. Images from a bit closer, of course, show it’s an unruly ball of hot gas that can expel long plumes out into space – but even this isn’t the whole story. Surrounding the Sun is a roiling wind of electrons and protons that shows constant turbulence at every size scale: long streaming jets, smaller whirling eddies, and even microscopic movements as charged particles circle in miniature orbits. Through it all, great magnetic waves and electric currents move through, stirring up the particles even more. This solar wind is some million degrees Celsius, can move as fast as 750 kilometers (466 statute miles) per second, and – so far – defies a complete description by any one theory. It’s hotter than expected, for one, and no one has yet agreed which of several theories offers the best explanation. 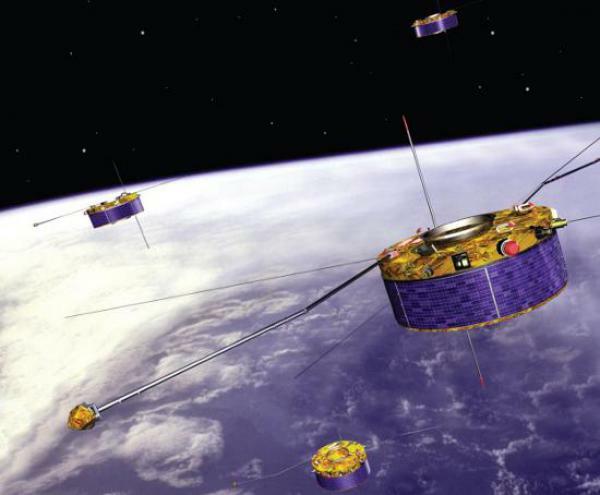 Now, the ESA/NASA Cluster mission – four identical spacecraft that fly in a tight formation to provide 3-dimensional snapshots of structures around Earth – has provided new information about how the protons in the solar wind are heated. “We had a perfect window of 50 minutes,” says NASA scientist Melvyn Goldstein, chief of the Geospace Physics Laboratory at NASA’s Goddard Space Flight Center in Greenbelt, Md. and co-author of the new paper that appeared in Physical Review Letters on September 24. “It was a time when the four Cluster spacecraft were so close together they could watch movements in the solar wind at a scale small enough that it was possible to observe the heating of protons through turbulence directly for the first time." Scientists know that large turbulence tends to “cascade” down into smaller turbulence -- imagine the sharply defined whitecaps on top of long ocean waves. In ocean waves, the energy from such cascades naturally adds a small amount of heat from friction as the particles shift past each other, thus heating the water slightly. But the fast, charged particles – known as “plasma” - around the sun don’t experience that kind of friction, yet they heat up in a similar way. Somehow the magnetic and electric fields in the plasma must contribute to heating the particles. Decades of research on the solar wind have been able to infer the length and effects of the magnetic waves, but direct observation was not possible before the Cluster mission watched large waves from afar. These start long as long wavelength fluctuations, but lose energy – while getting shorter – over time. Loss of energy in the waves transfer energy to the solar wind particles, heating them up, but the exact method of energy transfer, and the exact natAure of the waves doing the heating, has not been completely established. In addition to trying to find the mechanism that heats the solar wind, there’s another mystery: The magnetic waves transfer heat to the particles at different rates depending on their wavelength. The largest waves lose energy at a continuous rate until they make it down to about 100-kilometer wavelength. They then lose energy even more quickly before they hit around 2-kilometer wavelength and return to more or less the previous rate. To tackle these puzzles, scientists used data from Cluster when it was in the solar wind in a position where it could not be influenced by Earth’s magnetosphere. For this latest paper, the four Cluster spacecraft provided 50 minutes of data at a time when conditions were just right - the spacecraft were in a homogeneous area of the solar wind, they were close together, and they formed a perfect tetrahedral shape - such that the instruments could measure electromagnetic waves in three dimensions at the small scales that affect protons. The measurements showed that the cascade of turbulence occurs through the action of a special kind of traveling waves – named Alfvén waves after Nobel laureate Hannes Alfvén, who discovered them in 1941. The surprising thing about the waves that Cluster observed is that they pointed perpendicular to the magnetic field. This is in contrast to previous work from the Helios spacecraft, which in the 1970’s examined magnetic waves closer to the sun. That work found magnetic waves running parallel to the magnetic field, which can send particles moving in tight circular orbits – a process known as cyclotron resonance -- thus giving them a kick in both energy and temperature. The perpendicular waves found here, on the other hand, create electric fields that efficiently transfer energy to particles by, essentially, pushing them to move faster. Indeed, earlier Cluster work suggested that this process – known as Landau damping – helped heat electrons. But, since much of the change in temperature with distance from the sun is due to changes in the proton temperature, it was crucial to understand how they obtained their energy. Since hot electrons do not heat protons very well at all, this couldn’t be the mechanism. That Landau damping is what adds energy to both protons and electrons – at least near Earth – also helps explain the odd rate change in wave fluctuations as well. When the wavelengths are about 100 kilometers or a bit shorter, the electric fields of these perpendicular waves heat protons very efficiently. So, at these lengths, the waves transfer energy quickly to the surrounding protons - offering an explanation why the magnetic waves suddenly begin to lose energy at a faster rate. Waves that are about two kilometers, however, do not interact efficiently with protons because the electric fields oscillate too fast to push them. Instead these shorter waves begin to push and heat electrons efficiently and quickly deplete all the energy in the waves. Future NASA missions such as the Magnetospheric Multiscale mission, scheduled for launch in 2014, will be able to probe the movements of the solar wind at even smaller scales. Cluster recently surpassed a decade of passing in and out of our planet's magnetic field, returning invaluable data to scientists worldwide. Besides studying the solar wind, Cluster’s other observations include studying the composition of the earth’s aurora and its magnetosphere.